Holloway loves referencing the 'Barclays' bit of the Premier League name! As Blackpool lined up against Wigan back in August, most fans were left wondering what awaited them in the highest league in the land. Fifteen matches in to the season and most Blackpool fans know what this Premier League is all about and how we fit in to the landscape. Sick and tired of being branded a breath of fresh air, Blackpool are more than this and there are some real reasons behind this success which if keep repeating themselves then come the end of the season the Tangerines will be dreaming about a second season in this league and being suitably patronised by idiots who go on about second season syndrome without ever really defining what that actually means. The last two games versus Wolves and Bolton have seen two performances that encapsulate everything that Blackpool are about both from a negative and positive stand point. Stick to what they are doing and Ian Holloway will achieve what was once deemed impossible. To keep Blackpool Football Club in the richest league in the world. Here are ten things from Blackpool’s first fifteen games that should they continue will ensure another large party on the promenade. The approach that Blackpool have taken in attacking every match has been an approach away from the usual one trodden by a promoted team. This has taken many managers by surprise and they’ve appeared to take Ian Holloway’s claim to attack the Premiership with a pinch of salt. So far Blackpool have scored 23 goals, created 223 chances at an average of 15 per game, scoring 10% of them, with a further 19% hitting their target. Sustain this over the next twenty three games (hypothetically speaking) then Blackpool will have bagged 58 goals by the end of the season, 16 more than Burnley last year and a tally that would have been the eighth highest in the whole season. It works, it’s positive, it covers all corners of the pitch, and it allows Ian Holloway to get the most out of his players. Each player knows his role and those of his team mates, they subsequently know where everyone is during each phase of play and this helps the team build on field relationships. The system has evolved this season away from the flatish 4-3-3 of last season in to a more modern 4-2-3-1 or 4-2-1-3. The opposition are used to a team like Arsenal setting up in this manner, but a newly promoted side – Never! Most fans of Blackpool will be more than familiar with the usual, ‘We can’t lose to this lot’ attitude of fellow fans, but it appears that opposition managers aren’t too far from the same mindset. As long as managers send out their teams in a standard flat 4-4-2 then Blackpool will keep picking up points. Look at Owen Coyle last Saturday, he sent his team out without making any concession for Blackpool thinking that his players and his outdated 4-4-2 would ‘have too much’ for little Blackpool. Only around the sixty minute mark after seeing his midfield being outnumbered three to two and constantly being passed through did he start to think he needed to change. Surely after ten minutes as Elliot Grandin received the ball behind a bemused Fabrice Muamba he should have realised and made a change. Thankfully he didn’t and Blackpool ascended in to a lead. Following on from the last point, the teams who have made decisions to counter us have had the most success. Most notably Birmingham stunted our formation with a canny application of a narrow diamond midfield. Mick McCarthy fielded a five man midfield and Everton and Blackburn both stifled the midfield by playing a holding midfielder in a 4-1-4-1. If teams start doing more homework on our play then the season may grind to a halt quickly, people were wondering where Blackpool’s plan B was after defeat to Birmingham, however, right now Holloway can keep plan B till later. 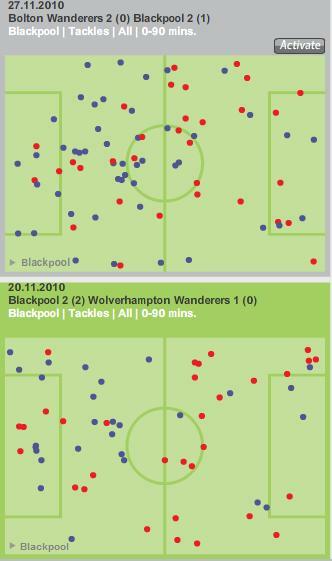 A look at the last two games goes a long way to show that Blackpool are starting to defend well after previously being very attack minded. The back four works well as a unit and looking at their chalkboards in the last games they won 48 tackles (the highest this year) and even won the aerial battle against a Bolton side who have been so dominant in the air at times this season. 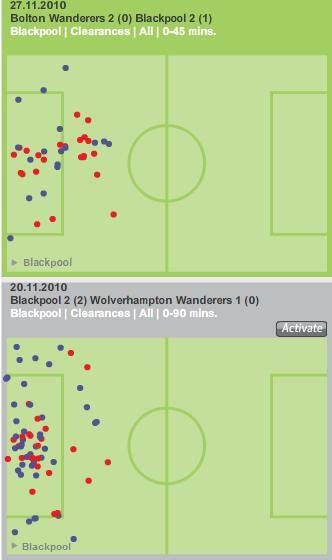 Blackpool cleared their lines superbly against Wolves making 42 successful clearances (the highest this season for Blackpool) at a success rate of 63%, whilst against Bolton they were less successful only clearing their lines 35% of the time. This helps to explain a little of how Blackpool failed to hold on to their lead against Bolton, as the match progressed clearances failed and the opposition were able to regroup and hit back. Stout defending against Wolves, but less success against Bolton. Well not quite, that would be Barcelona who made 684 passes against Real Madrid in the recent ‘el classico’ with a completion rate of 89%. However, Blackpool pass and pass the ball well, no cynical lumping of the ball up the field here. Keep passing like this till the end of the season and teams will be broken down time and again. To put this in perspective, Blackpool average 474 passes per game with a completion rate of 75%. There is room for improvement in the completion rate and Holloway will keep striving for that if he is to head along his desired Spanish route to playing football. The key is the way that Blackpool have started to penetrate in to opposition boxes, look below at the passes that made it in to the Bolton box last Saturday. This inevitably leads to scoring chances, goals and points. Blackpool managed to pass the ball well in to the danger zone and broke through the defensive line of Bolton. A lot of fans reference this as a long ball, but it is much more sophisticated than that and has been used for years by many top quality teams (most notably Ajax and the Dutch national team) to shift defence in to attack, stretch the play and to set up a ‘move’. Teams are genuinely uncomfortable with such a ball being played and as for Wolves, it caused such concern for Mick McCarthy that he moved Michael Mancienne back to right back to counter the threat. This ball was in use last season and appears at times to be a set move. Next time it is played from left to right up to the right hand foward, check to see if Neil Eardley has moved up and Charlie Adam has moved in towards the ball also. If so, expect Adam to pick up the ball early from the knock down and set up either an overlap for the full back or in behind the defence for the forwards to run on to. Here you can see the way the Blackpool play a long, left to right diagonal ball as a set attacking move. Up to now, there’s not been a bad run where points have dried up, only one occasion where back to back losses have been recorded, if that remains the same then that is crucial to keeping the status as a Premier League team. The media love a newly promoted team to hit a rough patch so they can wheel out the cliche machine and churn out more claptrap which can nag away at people’s confidence. Get DJ with the ball at his feet in the right areas…..
And he will score. He worked so hard at the Reebok and he is so much more effective in the central striker role than he was in the deeper midfield based role. At the rate he’s going he may bag around 8 goals by the end of the season and they’ll all help to keep Pool safe. If his team mates get the ball to his feet in to the area between the goal and the penalty spot he’ll score. All his eleven goals in the Championship last year came in this zone. Blackpool are at their most vunerable after they’ve just scored, when they’ve conceded a free kick or in the last few minutes of games. 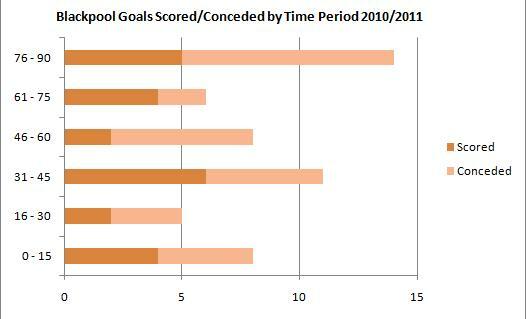 9 of the 29 goals conceded this season have come in the last quarter of the game. When Manchester United come to visit on Saturday, should Ian Holloway keep his side performing the way they have up to now then Alex Ferguson will need to pay respect to Blackpool and ensure that he counters the threat Blackpool carry. Blackpool will create chances again on Saturday and if the defensive robustness found recently comes through again then the men in Tangerine may well sneak something from the fixture.